Wise Blood is a rigidly formal, meticulous recreation of Flannery O'Connor's first novel. It's both an admirable aspect of the film and arguably a problematic one. When dealing with a great piece of literature, any modest screenwriter will probably feel compelled to respect the author's creative ambition rather than their own. In other words, to strictly adhere to the source material is to honor the author of the work (unless you're dealing with a book of such massive length that taking creative liberties is almost a necessity, as seen with Anna Karenina last year). 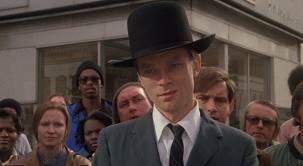 Thus, it's admirable that Wise Blood respects O'Connor's work enough to make a cinematic carbon copy of it. Though it could also be said that the book is so unorthodox and absurd that any kind of creative liberties with the film would be flat out superfluous. The reason I find this to be problematic has less to do with the objective quality of the film than with the nature of literary adaptations in general. Watching Wise Blood, one feels O'Connor's work is merely being mimicked (though this is partly due to the brevity of the text). It's got a great group of actors (esp. Harry Dean Stanton and Ned Beatty) to deliver the lines taken directly from the novel, yet other than "being faithful" and "getting good performances," what exactly makes this movie stand out? And it doesn't help that it's directed by John Huston, who according to Andrew Sarris (and just about every other auteur critic), was merely a director of a few "actor's classics." I generally think of Huston as a great American filmmaker, and Sarris' opinion of him represents one of the major problems I have with the auteur critics (for anyone interested in a good argument against them, Pauline Kael's essay Circles and Squares is a must a read). True, Huston didn't have any particular "style" (though one can't overlook the fact that his workmanlike, competent direction is more refreshing than poor "style"--remember, style is only good if it has rock solid backing), but I always admired him because he was writing most of his best movies. And yet, Huston's very ordinary direction doesn't exactly help Wise Blood out. The movie has a pedestrian look to it (the closest it gets to having any kind of vision is during the black and white opening credits, when John Huston's name is spelled Jhon), which doesn't serve the juiciness of O'Connor's story very well. Reading her novel, one gets wrapped up her unusual, yet stunning writing structure. It's what makes the story work. But the movie's lacking that "look" and "feel," which would be the cinematic equivalent of O'Connor's prose. But don't get me wrong. This is more of a query into the possible shortcomings of the film than a direct criticism of it. I enjoyed it, but at the end of the day, one really does feel like it's O'Connor who's to thank, not Huston and his cast. Still, as far as movies go as a means for great storytelling, the movie's a striking success. It's put together so tightly that the greatness of the story is never put into question. It allows one to think about O'Connor's questions of the conflict between religious and secular fanaticism just as clearly as one could after reading the novel. It's arguably the most compelling thematic Huston ever dealt with, but ultimately I can't shake that nagging feeling that the movie doesn't quite earn any reward but that of basic competence. And that raises the question as to when we should look at something on its own terms and when we shouldn't. Depending on the approach you take, you can either make or break Wise Blood's legitimacy.